After three years of research, Breakfast Products has introduced Points - self-touted as the most advanced sign on earth. 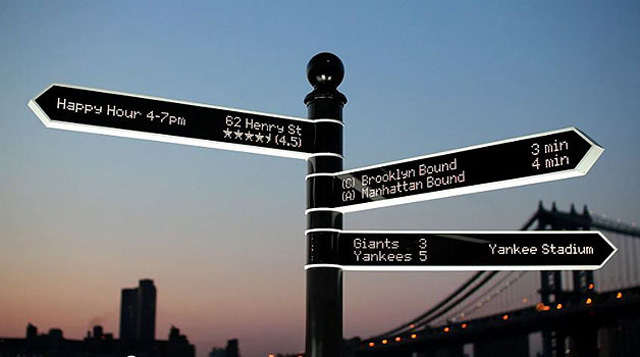 While we cannot substantiate that particular claim, the three-arm directional display is an interesting and innovative approach when it comes to delivering information to those within its immediate vicinity. In a nutshell, Points utilizes an Internet connection to update a five-segment interface menu that is located at user height on its pole. Using digital data (compiled from Twitter, Foursquare, RRS feeds, etc.) and onboard sensors, the motorized directional arms swing to display information about cities, sporting events, transit, etc... all of which is easily read by those nearby (watch the video, and it will all make sense). Physically speaking, the Points sign is nine feet tall, six feet wide and primarily constructed of lightweight and corrosion-resistant aluminum. Mechanically speaking, the arms utilize micro transmissions (with 11 gears and multiple motors) and rotary electrical interfaces (removing the issue of tangled wires) to smoothly swing 360-degrees around the pole regardless of weather or temperature. Electronically speaking, more than 16,000 LED lights ensure that the displays are bright and readable. Lastly, the processor has been designed to keep its chipset cool and minimize power drain. We can think of countless applications for Points (airport terminals and car shows would be a perfect fit), assuming it all works as advertised. Larger versions with even more swinging arms would work well for those behind the wheel. Rest assured, this is just the tip of this digital information iceberg. Check out Points by scrolling below to see the video, then head on over to Breakfast Products' website to try it out remotely via Twitter.